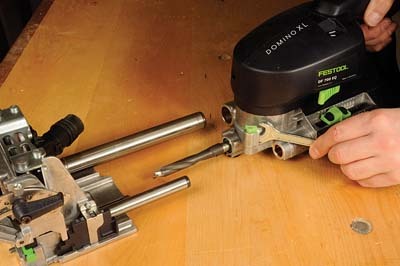 Festool presented the woodworking world with the Domino back in 2006. Such was its impact that you'd have to look long and hard to find another development in power tool technology since that has had as much impact on the way we work. As someone who struggles to find a new angle each month on the subject of woodworking I don't envy the technicians who are charged with developing new concepts in what is an ancient process. Festool get round this mental block by establishing a few ground rules. First, they won't even consider working on a new product that's already in the market-place if they can't significantly improve on the idea. Second, they don't go in for the 'big sell' believing that the tools they produce are capable alone of delivering the right message. So with the bar already raised way above some of their competitors how does a second generation Domino fit into the market-place? The Domino XL has much in common with the original machine but as the name implies it's a bigger unit. 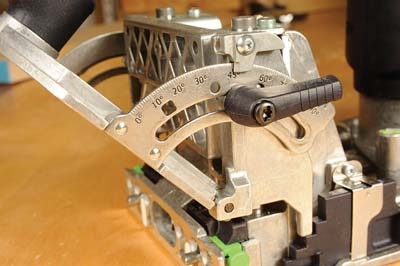 The original concept remains the same; a hand-held machine to cut flat bottom mortises for loose tenons. 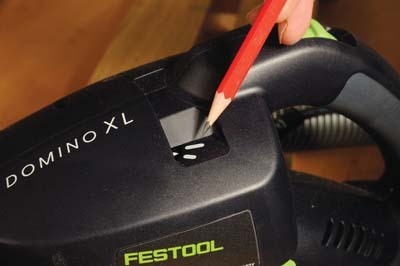 The XL is aimed squarely at the joiner and in true Festool fashion it's designed to operate at the heart of a system where it can make a difference. The XL uses cutters from 8 to 14mm and will bore to a depth of 70mm. The pre-cut beech tenons are available in three short sizes (80, 100 and 140mm) and in 750mm lengths. The joint sizes are ideally suited to larger stock and the powerful 720W motor runs smooth and is relatively quiet. I worked repeatedly on sections of oak for this review process and at no time did the motor feel laboured. There are a number of features on the XL that make it a good machine for repeat cutting and batch work. 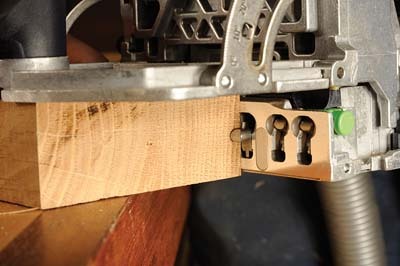 A lever on the side of the motor casing causes the cutter to produce mortises wider than the pre-cut loose tenons. When working from free-hand marks this compensates for any misalignment in the marking or machining process. of the machine to help with this. The sprung stops can be depressed into the casing where they remain until released by a small button each side of the plate. 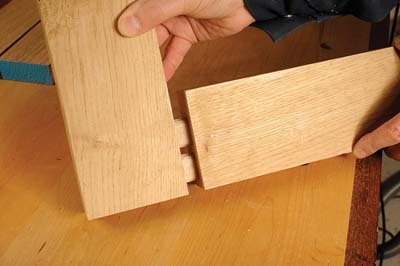 As an example the spacing allowed for mortises to be grouped in pairs on a frame leaving space for any extra details like grooves, mouldings or a rebate. With so many nooks and crannies built into this machine it's good that the extraction port is well placed to remove the large amount of waste for the 12mm cutter I was using. There are a few makes of power tools available that are calibrated in the factory to perform accurately from the scales indicated on them. Festool is one of them and this makes for quick initial set-up for a single process and freedom to switch between settings for a complex one. The XL will work from angles between 0° to 90° with presets along the way. Depth of cut from the face of the fence can be set free-hand or by using pre-sets. 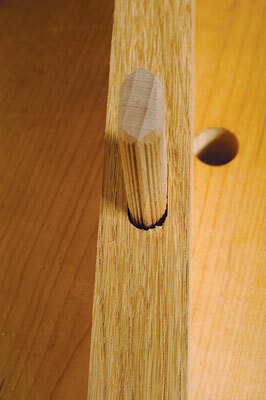 The depth of the mortise can also be adjusted to a given setting or permitted to work within a specific range. Tool changes are also quick to do. 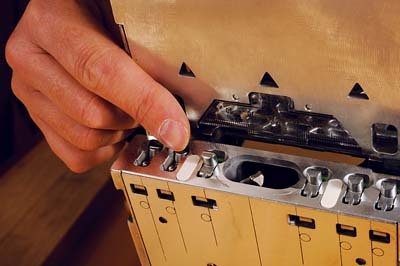 A small lever is flicked with the wrench supplied, which releases a catch holding the machine body and faceplate together. It's possible to swap tooling without disassembling the XL but there is a risk of knocking the sharp edge of the tool against the metal of the machine. It is not a huge leap from furniture maker to joiner and the Domino XL closes the gap even further. 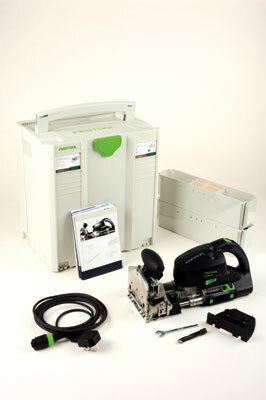 There is an interesting demonstration of this machine to be found on the Festool website. A comparison is made between the processes required to assemble a single typically framed panel door with stand-alone machines and the Domino XL. Some parts of the process are shortened by as much as 40% using the Domino system. It is unlikely that manufacturers producing doors in any quantity would benefit from a Domino XL. Those looking for a way to compete on a smaller scale undoubtedly would, for the machine lends itself to a whole host of other opportunities; think chair making, large tables and other architectural joinery. The XL has a range of accessories, some of which are interchangeable, which expand the use of the machine to working on round section and handrails. For external joinery Festool produce the Sipo range of dowels that are treated to resist mould and insects. Those already used to the ways of the Domino will have no problem getting to grips with the XL. Those who are not might be put off by the price but itâ€™s not always the best frame of mind to be in when considering how to grow your business. This machine represents a small investment in return for some new opportunities.